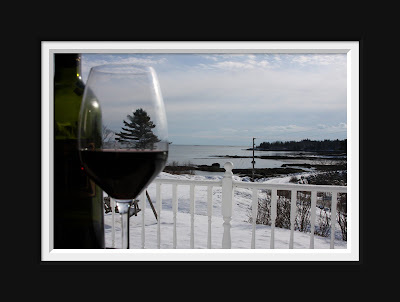 Winter in Maine...some say it's gray, dreary, cold and long. I say it's all how you look at things and it's just beautiful. I am an eternal optimist. A blanket of fluffy snow on the ground and I'm ready to bundle up and head out with my camera. The silence of snow when you're out on a trail can be exciting yet as calming. Snowshoes are inexpensive and don't require skill. The tree limbs heavy with fresh snow look beautiful after a snowfall. Take the time to absorb how your surroundings appear during the various seasons. Undulating ice on a lake can be mesmerizing. And contrary to popular belief, blue skies are common in Maine after a snowfall. With every item of clothing available today containing fleece, it's easy to stay warm. And when you get back, make a batch of homemade cookies and hot chocolate. Watch a movie, read a book, play cards, get together with friends and cook a pot of stew or chowder to enjoy with some crusty bread. As for those short days and early sunset? For every shorter day, isn't there a longer evening? We don't lose time, it's all what we do with it. Over the years, owner's quarters have changed quite a bit. It was commonplace that innkeepers would occupy a room or two in the basement or on the same floor as the guest rooms and share common living rooms. But in more recent years we've seen a change. Many buyers have made the decision to leave corporate jobs in exchange for the innkeeper lifestyle, but without compromising personal space. And owners have expanded their spaces. One of the best examples that I have seen of fabulous owner's quarters is The 1802 House Inn Bed & Breakfast in Kennebunkport, Maine. THIS is one inn where the guests and owners alike are spoiled with comfort, elegance and SPACE. The inn has been busy with Christmas Prelude (a very popular holiday tradition in the Kennebunks) and I haven't been able to photograph the owner's quarters. But I cannot wait to get my camera out and attempt to do the space justice! So until I can get pictures posted, I will describe it in words, as best I can. The inn is ideally set up as a 6 room guest wing at one end and owner's quarters at the other with common space in the middle. The flow moves from guest rooms, to living room, to dining room and into the private kitchen space. And for a foodie like myself who loves to cook, this is a kitchen! A mix of contemporary black granite countertops, ivory painted old-world cabinetry, terra cotta ceramic tile floors and plenty of light from a large bay window make for a beautiful space to spend time in. The center island is large enough for stools, storage, bar sink, and more. A long pot rack adorns a wall and beautifully displays copper bottom saute pans. There's an office and separate private entrance into the kitchen. Through the kitchen, up a few steps and beyond a set of decorative-panel double doors and you've entered into a bright, beautiful space: a spacious living room and dining room, both with fireplaces, a powder room, a deck, and a wet bar with cherry cabinets and granite. Up a full flight and there are two bedrooms with en-suite baths. The master bedroom has custom built-ins, a fireplace and a large master bathroom with a two person walk in shower and two person Jacuzzi tub. Who says only the guests should be pampered? This is Craignair's view from their shorefront. This is one of the two buildings that make up Craignair Inn. Offered at $1,150,000, Craignair Inn is a mid-coast waterfront inn built in 1928 and was given a 2008 "FODOR'S CHOICE" rating. The room revenue is very solid with a nice supplemental revenue stream from the inn's restaurant and the chef has expressed interest in staying with the inn and new owners. This could be an ideal property for the creative type - there are many options not often found in a property with so many redeeming qualities: it's situated in mid-coast Maine (making it very accessible to many travelers whether coming into Boston, Portland or Bangor); mid-coast Maine is also seeing an increased volume of off-season visitors making this a wonderful spot to market to those looking for a quiet getaway in the winter, particularly for the Boston weekend getaway traveler and with the bar/restaurant license); new owners could offer a weekend classic country-inn-style champagne brunch open to the public as well as to guests; the inn's spot at the end of a granite causeway with no thru-traffic is a wonderfully secluded spot, yet just 15 minutes to Thomaston. The inn enjoys water frontage with a beautiful view with many areas to relax and unwind on a deck to absorb it all in. And for those who are looking for fewer rooms than 21? The setup is such that many of the rooms could be combined to create small suites, therefore limiting your number of rooms but increasing the ADR. This is really a wonderful place and worth taking a look at! I'll be posting new photos later this week and will be very excited to share them.